This was it, our last chance for some fish before hitting the dock. The sun was nearing the treeline as as we baited our hooks and drifted up to where we wanted to anchor . Through out the day our anchor would take hold only to let go occasionally when a boat would roar by kicking up waves. We would have been better off with a 2 anchor system i think. This happened again and we slowly drifted off spot, so it was decided we would try a controlled drift and bring in the anchor. Not far down stream I felt something slam my jig and shiner and I set the hook. I called out "fish on" but whatever I hooked into didn't really tug to much. It was then that Frodo called out "fish on" as well. I could feel what I hooked into move and it became clear we both hooked into the same fish. He let out some slack line as my line and rod were getting tugged upstream under the boat. After a few seconds his line came free and I figured I was snagged up. One careful lift of my fishing rod to see if that was the case and it was clear I wasn't. I felt a head shake or two and line began to peel off my reel. Everyone else in the boat reeled up and it was then that the fight really took off. I seemed to have very little control over this fish off the hop, it would head where it wanted to when it wanted to and hug bottom easily. Every time I would gain a bit of line, the fish would take it back. It didn't feel like a walleye, and as my heart raced I wondered what it was. A catfish? A sturgeon perhaps? Maybe a REALLY big walleye. The options go on when you are fishing this historical river and after about five very tense minutes, I finally got the fish to the surface. It was a channel catfish and off it charged for another run. My Fenwick medium action HMG was holding up to the fight, not the typical rod I would use for catfishing. 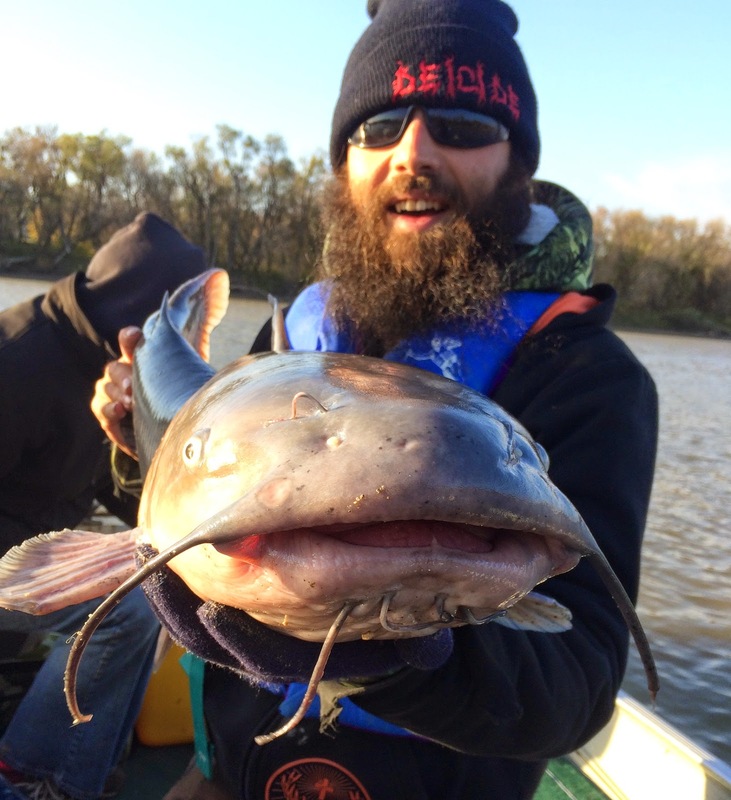 After a few close calls with the line near the propeller, the catfish was scooped up by Jay and in the boat for some pictures and measurements. 36 inches long and a new personal best. It was very cold to the touch and surprisingly enough it cooperated for pictures quite nicely. Its head was gargantuan with a serious over bite and a nose like hump above its upper lip. With a moment or two of revival boat side it gave a good kick with its tail and headed back to the depths. 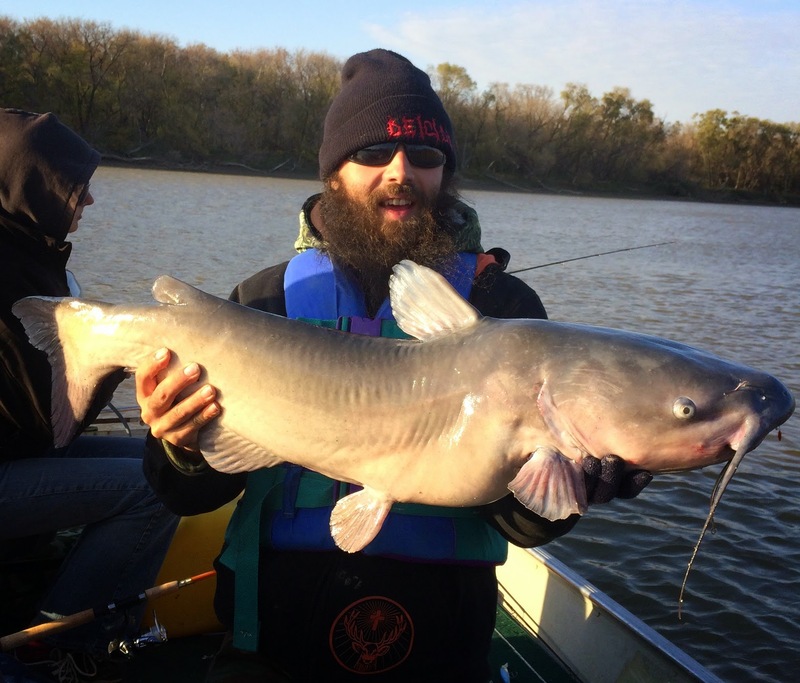 The fight, the fish and the release were all very special to me, this cat was 3.25 inches longer than my personal best and very heavy. I have lost more brutes fishing from shore than I would care to admit, snagging up in rocks or logs mostly and I credit a lot of the successful catch to Jays boat control. It wasn't the target species, but the saving grace on a very windy day on the Red River.